Once again, marketers have muddied the tech waters by misleading consumers with less-than-truthful descriptions of their products. Like “4G Smartphones.” Or “4K TVs.” Here, AT&T has gone beyond the pale with their ‘MicroCell’ offering, which is actually a femtocell. It’s akin to calling skateboard a motorcycle. This “wireless cell signal booster tower antenna” is built by Cisco Networks and branded with the AT&T logo on the housing. The tower delivers up to 5 bars of AT&T cell signal to 3G and 4G mobile devices, supporting as many as 4 users simultaneously. Measuring 5.2 x 2.5 x 5.2 inches, it weighs slightly over a pound. Given the oblique corporate nature of AT&T, it comes as no surprise that the company either by intent or oversight omits specifying the network range of their product in the MicroCell user manual. To their credit, the manual adds that while the device “supports data usage, it is not intended to be a replacement for your wireless network (Wi-Fi).” Remember this; we’ll refer to these words before concluding. 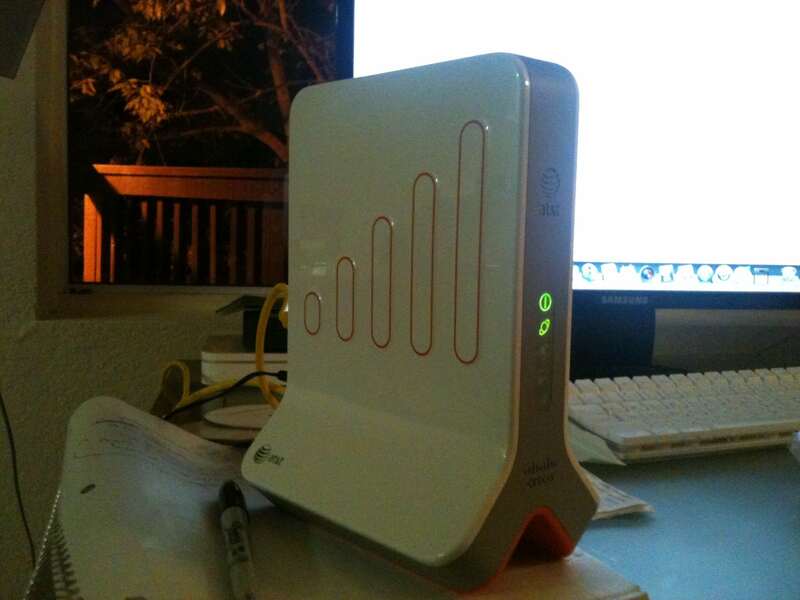 A fixed broadband Internet service, either cable, DSL or fiber, with speeds of at least 1.5 Mbps down and 256 Kbps up. Note that the MicroCell doesn’t work with satellite or mobile broadband. A dedicated Ethernet port available from the router or modem. Computer with Internet access to activate the MicroCell. Ensure the MicroCell can access a Global Positioning (GPS) signal to establish the location of the device. Installation near windows is highly suggested. Postpaid wireless plan aka “online wireless account” from AT&T. AT&T 3G, 4G or 4G LTE wireless handset. Note the last stipulation — the MicroCell works with only AT&T devices since it transmits and receives solely those frequencies AT&T uses in its cellular networks. Like other femtocells, the device is locked into use with just one carrier. More caveats: while calls transfer from the MicroCell to the AT&T cell tower with the most robust signal, calls started on the cell tower do not transfer to the MicroCell. Too, using the MicroCell doesn’t necessarily mean unlimited calling. While users have the option to buy the ‘AT&T Unlimited MicroCell Calling’ plan for an individual phone number or an entire AT&T account, one may simply opt to use existing minutes from another wireless plan. Also, the MicroCell can be used in conjunction with powerline Ethernet adapters to connect with a router. In years past, the Internet was rife with tales of MicroCell security breaches. In response, the MicroCell now requires an “approved user list” to access one’s local wireless network. While it limits usage to no more than fifteen users per account, it’s a basic security precaution to keep your neighbors or anyone else in close proximity from burning through your data cap. If an AT&T 3G, 4G or 4G LTE wireless cellphone number needs to be added to an approved caller list, visit att.com/MicroCell to manage account settings. Is the MicroCell Different from a “Signal Booster”? According to the blog at wilsonamplifiers.com, “an AT&T Signal Booster takes the existing weak (cellular) signal, amplifies it multiple times up to 32X, and then rebroadcasts the boosted signal to an area in need in your home or car.” That’s right; specialized signal boosters meant for use in one’s vehicle are available and can be used with Bluetooth headphones. They’re powered by a USB-A connector and a cigarette lighter power supply adapter. The benefits of a signal booster are obvious: better coverage, more reliable reception and more consistent service. Even better, a signal booster need not be locked in to one carrier’s signal. They’re “carrier-proof,” meaning they’re compatible with cellular signals from other major carriers. Best of all, a signal booster works with any mobile device (Android, iPhone, Samsung, etc.) — if it receives cellular signals, a signal booster will enhance its reception. And therein lies the rub; it has to receive at least some semblance of a signal for the device to work. On the other hand, the MicroCell requires a fixed broadband Internet connection. As the blog notes, those wily AT&T marketers are hoodwinking consumers into believing that by purchasing a MicroCell they’re getting their very own personal cell tower! In fact, the consumer is paying more for service he or she should already be receiving — in effect, subsidizing AT&T plant infrastructure. The bottom line: Do you need the AT&T MicroCell? In two words — probably not. Sure, if you’re in the middle of nowhere and can’t use a signal booster because there’s absolutely no signal to be had, then the MicroCell (or any femtocell for that matter, depending upon one’s carrier) is an alternative. But why burn up precious cellular plan minutes at home when one can use Wi-Fi calling? Most newer SmartPhones support Wi-Fi calling, so why not set up a personal wireless access point (WAP) or hotspot? If visitors need to call on their SmartPhone (and can’t access their own network), merely allow them ingress to your home WLAN — they can still take advantage of all the bells and whistles their device features. And it works with SmartPhones from all cellular networks. Save your money; MicroCells are best left to those with no other viable options.